Many people will agree that front suspension is not really needed on a fattie in the winter as the white stuff generally covers the nasty humps and bumps. The available squish in the aired down tires make most riding quite enjoyable. However, when riding trails frequented by hikers, front suspension is appreciated when hitting frozen sunken footsteps. When riding a fattie in the other three seasons the need for front suspension increases significantly. Is it absolutely necessary . . . not really. You just have to ride a little slower to minimize the front end jarring, or fly down the trail just kissing the crest of each bump. 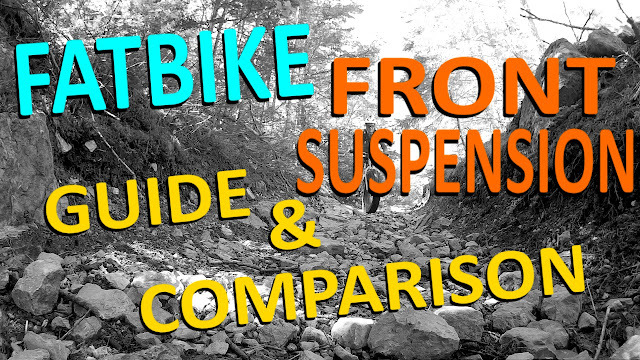 If your riding style is somewhere in between, front suspension should be in your future. 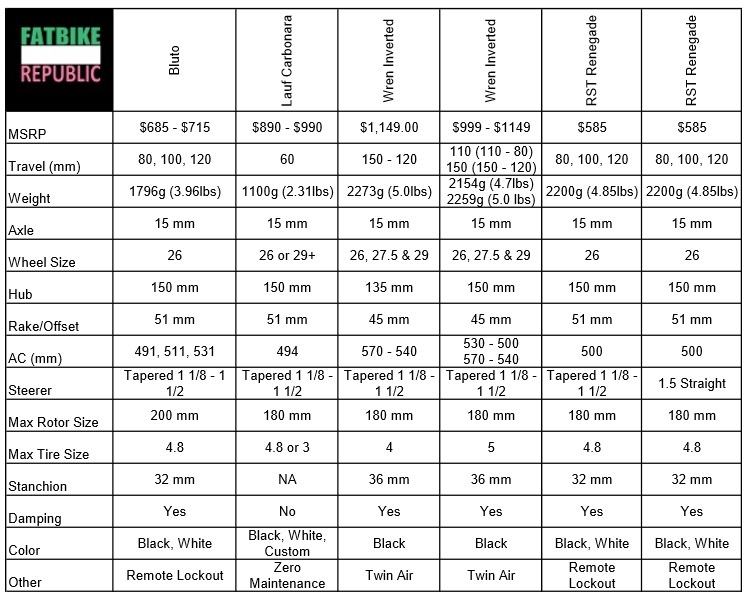 If you are the kind of rider who craves specifications and details, be sure to check out the chart below. When people think of fatbike front suspension the first name that comes to mind is the RockShox Bluto. Hitting the market in late 2013 the Bluto was the first mass produced front suspension for fatbikes. Available in 80 mm, 100 mm, and 120 mm variations this fork was well appreciated by those riding fatties outside of the winter months. Word around the LBS was that the Bluto does not use the latest and greatest technology, but rather borrows something from the not to distant past. It was quickly realized by the fatbiking community that the Bluto did not like the cold . . . which is unfortunate since winter is the preferred habitat of the fatbike. The aftermarket quickly came up with a solution, which oddly enough, when installed could compromise warranty. Nevertheless, the Bluto has smoothed out a lot of trails. Its simple to set up with air in the left fork and rebound and manual lockout on the right. It can run up to a 5" tire and the remote lockout option is quite popular. And a relatively simple spring swap can change your travel. Color options include black or white. Initially known as the "fork of many names" this inverted fatbike fork came to market around the same time as the Bluto and was initially stamped with an 11Nine and Carver logos. In 2014 Wren Sports started selling its Inverted Fatbike Fork and after extensive testing became exclusive North American distributor of this non-traditional fork. Extensive tweaking & improvements include: keyed stanchions, beefed up crown, stronger bushings, new axle, stock carbon fiber stanchion guards, cable guides and a TwinAir system. Keeping the larger 43 mm stanchions on top allows the lighter 36 mm lower stanchions to be more responsive. The TwinAir system, with two air valves (one on top and one on bottom) allow fine tuning of the fork. The adjustable rebound knob on the right fork keeps the damping in check and the lockout can make the fork rigid when needed. 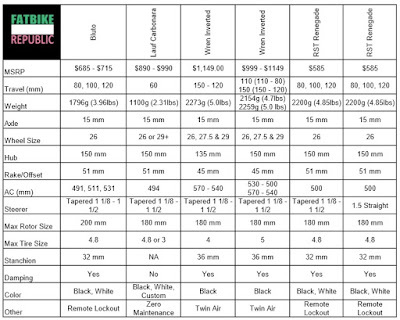 Travel is from 80 mm to a whopping 150 with the capability of running a 5.05" tire. Another interesting feature of this fork is that practically all the improvements can be retrofitted on older forks. And if you can't get it to a factory service center much of the maintenance can be completed by a competent mechanic. There are other companies that currently sell similar looking forks, however they do not have the extensive range of improvements that are available in the Wren. In 2015 RST (Rapid Suspension Technology) introduced its Renegade to the fat world. In addition to the 1.5" tapered steerer tube, they offer a straight option for those running fatties without the a tapered head. In 2016 the Renegade made its way into the Norco fatbike lineup on its Sasquatch 6.2. The Renegade offers three travel options (80 mm, 100 mm and 120 mm), has an optional remote lockout, room for a 5" tire and is available in black and white. Originating from land of geothermal energy we have the ultralight Carbonara fatbike fork. 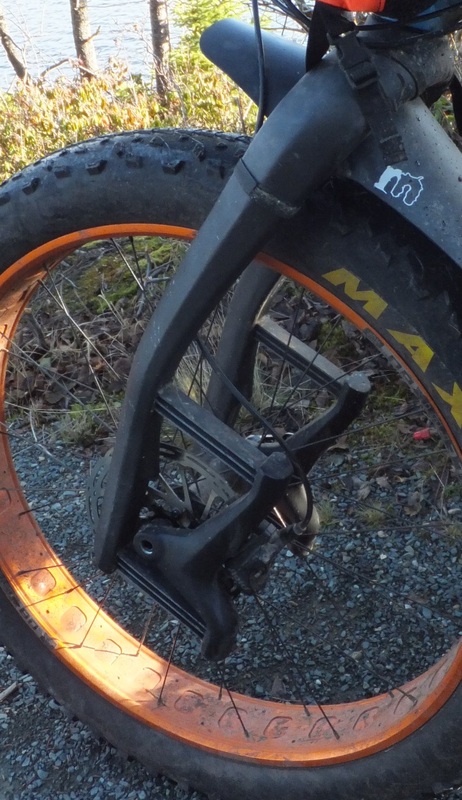 In 2015 these folk introduced the fatbike world to a truly original type of suspension with no moving parts. By suspending the axle behind the fork and between two sets of fiberglass leaf springs, the Carbonara give riders 60 mm of suspension. Weighing in at about 1100g (2.31 lbs) this is the lightest fatbike suspension fork on the market and it has the chops to run a 4.8" tire. However, the limited travel and lack of rebound damping may limit the fork's usability to the smoother of the gnarly trails. Lauf can actually supply the Carbonara in a number of cool colors (at a small premium) to compliment just about any fattie. Released early in 2017 this fat offering from Manitou is attempting to take a bite out of the market with it Pro (2210g) and Comp (2430g) models. The Pro version comes with hi and lo speed damping. Specs include 80mm - 150mm travel, 34 mm stanchions and "all temperature" performance. Only time will tell how this beast will perform. While not exactly a fork, the Stafast suspension stem does reduce jarring impacts on the front of a fattie. There may be some resemblance to suspension stems of days gone by, but the technology is all new. The Stafast suspension stem uses an adjustable air shock with 25 degrees of adjustable rise and it weighs in at around 360g. The Stafast stem was tested by Fatbike Republic and the stem delivered as promised. Check it out here. 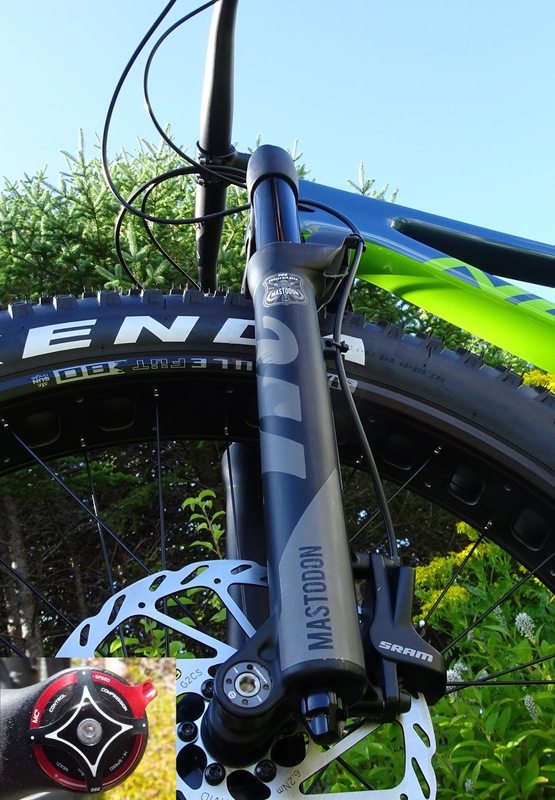 It provided 15-20 mm of suspension to take the edge off the rough terrain, its super easy to install and it can easily be swapped between bikes. In the very early days a few inspiring fatbike engineering ninjas adapted the Cannondale Lefty fork for fatties. There were numerous challenges in getting these babies to work correctly, but people did. Cannondale now offer the Lefty Olaf as a suspension option on their high end Fat CAAD 1. Finally there are the Asian knockoff fat suspension options that we have all seen on various sites. These forks are generally offered at crazy low prices and the specs seem a little dubious. Some people who have purchased them claim that they are exceptionally heavy and don't live up to the claims. I guess its a buyer beware situation. And for you detail nuts . . . click on the chart below to enlarge. As the fatbike market evolves there may be new players providing front end squish, but in the meantime you do have several options from which to choose.